Of those three, to which would you attach the most cred? It’s all about professionalism, and professionals have their own custom domain name. It’s really that simple. How do I choose a domain name registrar? You need to register your domain name through a “domain name registrar”. But who to choose? There are probably thousands of places out there where you can register a domain name, all of which vary in terms of cost and customer support (the latter being quite important if you’re not very technically-minded). I have had positive experience with both Gandi and Namecheap, who both happen to be included in Lifehacker’s list of Five Best Domain Registrars. If you can recommend others, we’d love to hear about the comments. Your name is a good place start (i.e. 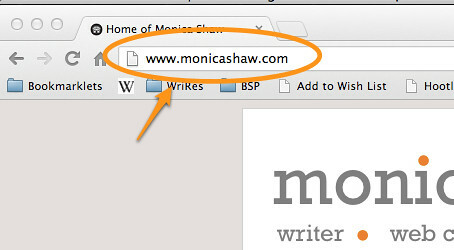 monicashaw.com). Go for something short, snappy and easy to spell, with no hyphens. Try to get a “.com” domain name if possible. If you’re name isn’t available, or you want to highlight your niche, pick a name that’s on topic (e.g. copyblogger.com, foodwriter.com). How do I use my domain name on my website? It all depends on how and where you host your website. Writer’s Residence customers can setup their custom domain by logging into their account and clicking on “Settings”, then “Website addresses” and following the instructions on the page. Folks using other web services should be able to find instructions with the service’s support documentation. Do you have your own domain yet? We’d love to hear your thoughts and experiences on setting up your own domain. How did you choose a domain name? Who did you register with? Any particular challenges that I haven’t mentioned here? Writing Samples: What if I haven’t been published? One of the biggest challenges in starting out as a freelance writer is getting your first article published. But to get published, you need show editors what you can do. How do you do that when you’ve never been published before? I faced this problem when I first went freelance in April 2008 (feels like yesterday). I’d been working as a banker for over a year and held previous jobs in software testing, research and teaching. I decided to quit my job and give this writing-for-a-living malarky a go but was left with a dilemma: to get published, I’d need to demonstrate to editors that I can write. But how would I do that without samples of published work? The ultimate writer’s Catch-22! My solution was to think a bit more broadly about “published work”. I ended up taking samples from teaching material, flyers and a few of my better blog posts and turning them into “writing samples” for my online writing portfolio. With the help of my portfolio (and a good pitch) I was able to land my first commission, an article on endorphins for The Daily Telegraph. After that, my arsenal of “published” writing samples only grew. Just because you don’t have any published clips or writing samples doesn’t mean disaster – we all have to start somewhere. Here are a few tips for dealing with clips in the early stages of your career. Write a couple of articles in the genre you’d like to write for and be your own editor. Make sure these articles represent your best work and give them the same amount of attention you would to a paid article. Who knows, you might be able to sell them someday. Start a blog or offer to write guest posts on other people’s blogs. This is a great way to build up your portfolio and gain exposure to your work at the same time. Many small publications and local newspapers are more willing to take a chance on an unknown writer. You can also try pitching shorter pieces to magazines as fillers. Don’t let a lack of clips keep you from pitching ideas. Simply write a great query and don’t mention clips at all. Instead, talk up other aspects of your experience that makes you right for the job. As always, play up your strengths and omit the weaknesses. Most importantly, keep writing! Write on spec. Some may disagree, but I think life is too short to work for free, so unless you’re writing about something you’d write about anyway because you just can’t help yourself, don’t spend the time until you’re sure you’re going to get paid. Professional writers get paid for their craft, and there’s monetary value in what you do. Don’t acknowledge your lack of writing samples. All professional freelance writers have writing samples – that’s what you are, right? In fact, that last point is the most important point of all: if you want people to take you seriously as a writer, YOU need to take yourself seriously as a writer. That means creating a presence that tells the world “hi, I’m a professional”. You don’t need a huge collection of published work to do this. You simply need a little creativity and confidence. Position yourself as a professional writer in your pitches, online profiles and especially on your website, not only through your writing samples, but in the words you use to describe yourself on your home page and about page. Soon enough, you’ll have more writing samples than you can keep up with.